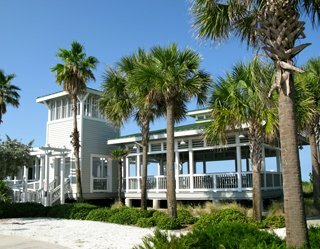 Sunset Beach Pavilion, located on Treasure Island FL, is a quiet and peaceful location for your Florida beach wedding. Let's clear up some confusion...Sunset Beach Pavilion and Treasure Island Pavilion are the exact same place. How can that be? Well, it is because the Locals call this building by its location rather than its formal name. It is force of habit for those that live here on the barrier islands, but can prove a bit confusing for out-of-town visitors. I have had so many people ask me about where each was located that I thought this short Blog entry would help provide some clarity. With its clean lines, open and airy design, and Old Florida feel...it is no wonder so many brides see the Pavilion at Sunset Beach as a romantic setting for the ideal Florida beach wedding. Not only is it a beautiful place, it is also incredibly inexpensive to rent. Couples have a far less stressful time of planning a memorable beach wedding when they know it can be done cheaply, with class. 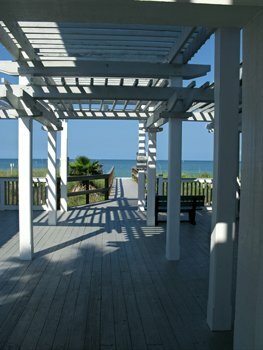 Looking out the breezeway toward the Gulf, it is no wonder brides find this place so romantic. 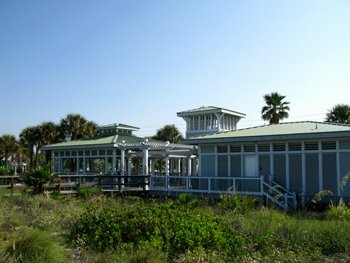 Buffered by a sand dune with mature vegetation, The Pavilion is separated from the beach area by a wooden boardwalk. The covered area next to the breezeway has picnic tables and keeps wedding guest lists small. Other nice features include a cool playground for small children, outside showers, clean and well-maintained restrooms, and a handicap ramp. I support all couples taking an hour with their parents to visit this quiet beach area. Walk around the pavilion, feel the breeze off the Gulf, and envision an intimate ceremony with close friends and family. The one small drawback of having your beach wedding here is the absence of electricity. There are also no grills provided. You will need to discuss with the City of Treasure Island FL (727-547-4575 ext. 237) about what to use to keep food warm. Actually, this works in your favor for holding down expenses for your Florida beach wedding. Cold cuts and finger-food such as fresh cut fruit and vegetables done by family members, can save a huge amount over expensive catering. Another thing to keep in mind if you plan a wedding at Sunset Beach Pavilion is that the beach itself is "renourished." This means the finely-granuled white sand on it has eroded away and been replaced with sand dredged from the Gulf. There are millions of tiny shells and shell fragments intermixed with the beach sand. While this is no big deal to local brides and their families because their feet are used to it, girls from out of town would be wise to walk the area where they will taking their vows. Cute sandals may be the caveat to bridesmaids and attending female (or elderly) guests. The need for accurate planning is critical for a nice but inexpensive wedding at Sunset Beach Pavilion. A valuable resource is How To Have A Gorgeous Cheap Wedding by author Jenn Brenner. It is a (cheap!) Kindle book you can read on your iPhone or iPad, and will give you many ideas about maximizing the beach wedding experience while holding expenses to a minimum. 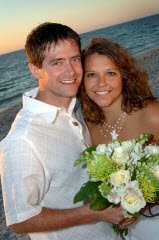 Although Jenn's experience is more general in nature, her practical tips and specific insights will save you tons of money on your Florida beach wedding. If you truly want a memorable beach wedding, keep the pavilion on Sunset Beach in mind. Do you really need a wedding diet?